Example of Lumen Facial Recognition search identifying a suspect using facial recognition on a surveillance photo. A vehicle description is used to further constrain results based on person-vehicle associations. 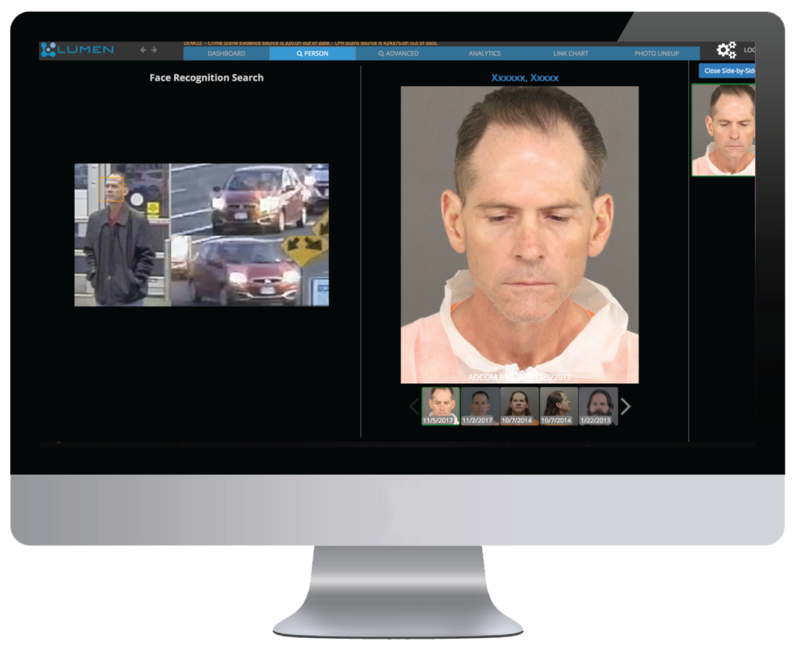 Combining advanced, deep learning facial recognition algorithms with a full set of known offender information from multiple sources (including criminal histories, vehicle and person links, and other criminal records information), Lumen facial recognition enables law enforcement investigators, officers, and analysts to narrow a list of potential suspects for a crime from millions of known offenders to a handful of likely suspects within a few seconds. The facial recognition tool’s sophisticated analytical capabilities for automatically assimilating offender information is capable of rapidly identifying a small number of suspects matching a ‘probe’ photo and other known details about a subject, such as vehicle associations or tattoo descriptions, then quickly and easily assessing those matches, resulting in better quality leads. Lumen facial recognition can achieve superior facial recognition matches in a matter of seconds without requiring extensive photo editing or manipulation, even when the probe photo has poor lighting, off angles, or other photo quality issues that can hamper positive identification.